Protective clothing is always equally required for the dentist, personnel and patients. In this category, we offer you gloves, safety glasses, surgical masks and caps, as well as surgical clothing and patient bibs and napkins; everything related to dental protective clothing. 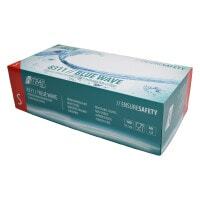 Shop a wide selection of sterile and non-sterile, powdered and non-powdered gloves made from Latex, nitrile and vinyl. Choose from our wide selection of dental masks with elastic or tape straps, and disposable or reusable caps. In this category, we offer a wide selection of surgical clogs that can be washed and disinfected, as well as over-shoes, surgical gowns and surgical drapes. From patient bibs to dental napkins and X-ray aprons, you will find everything you need for patient protection. 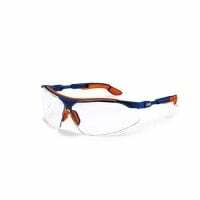 Buy safety glasses for lens wearers, standard safety glasses, safety masks and UV protective glasses at Praxisdienst-DENTAL. Dental protective clothing is a very important topic, as it equally applies to the employees, hygienists, dentists and patients. In the protective clothing category, we have gathered everything from gloves and safety glasses to surgical masks, caps and scrubs. We supply non-sterile, natural rubber, nitrile, vinyl, powdered and unpowdered exam gloves. These gloves are wearable on both hands, have a roll cuff and offer secure protection, great comfort and touch sensitivity. 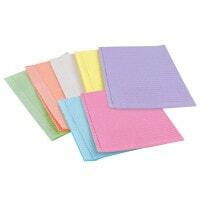 Furthermore, this category also entails sterile surgical gloves in comprehensive sizes and material composition. The sterile gloves are individually sterile packed and provide the highest level of protection and comfort during surgical operations. Safety glasses are another part of a dentist's protective clothing. These are required to protect against calculus, dust or liquids. Whether you need standard safety glasses, safety masks, UV protective glasses or safety glasses for lens wearers. 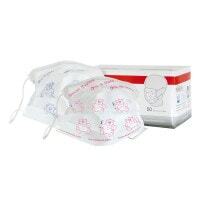 Are you looking for a reusable surgical cap or a colourful surgical mask with high filtering capacity? Then check out the product diversity found in this category. In addition to surgical clothing, surgical clogs and sterile surgical gowns, we also offer you a wide range of products for patient protection. 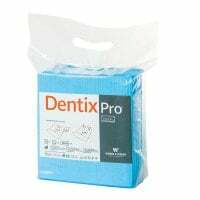 We provide a comprehensive assortment of water-repellant dental napkins and patient overlays to reliably protect the patients' clothing against moisture and soiling during the treatment. Additionally, you will find a large selection of various x-ray collars for adults and children in the patient protection category. From gloves to x-ray collars, you can conveniently order dental protective clothing online with Praxisdienst-DENTAL.